The permission model ARPI(Account—Role—Permission—Interface) is based on the thought of system level permission and interface level permission. System level permission controls whether an account can deploy or call a contract. When a request is received, the system will check the sender’s permissions and will permit or reject accordingly. Interface level permission controls whether an account can call a specific interface of a contract. The admin can give an account the permissions to call all or part of the interfaces of a contract. An account (person or organization) can only have one specific role, but a role can be assigned to zero or more accounts. In practice, a role may have multiple accounts with different pair of public and private keys for each，when a transaction starts, the sender signs the transaction with its private key, and then the receiver can verify it by using sender’s public key to know which account the transaction was initiated from, so that the transaction can be controlled and traced. A role can have multiple permissions and a permission can also be assigned to multiple roles. You can have fine granularity of permission control under the ARPI model. You can set permission to the contract’s interfaces. TransactionFilterChain contract is deployed along with the system proxy contract during initialization, and it is registered by system proxy contract at the same time. 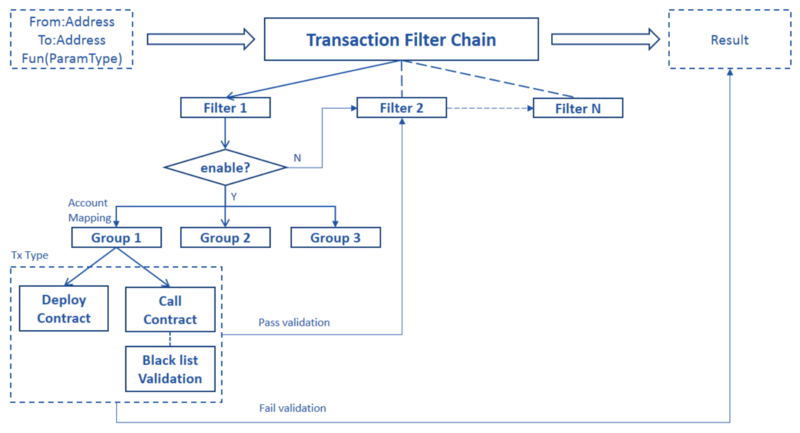 All the permissions’ CRUD is maintained by TransactionFilterChain on a blockchain. When a request is received, the system will check whether the sender’s account has permissions to the corresponding operations, if yes, then it is executed, otherwise exception is thrown. 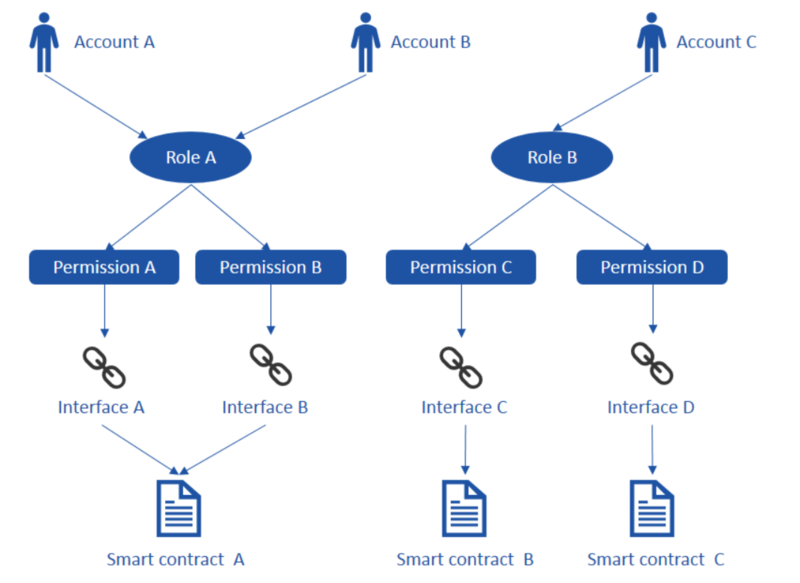 Deploy contract, only the approved contract can be deployed on the chain for execution. Call contract, only the permitted accounts can call the corresponding interfaces of the contract to execute their business transactions. TransactionFilterChain includes multiple independent filters with it’s specific filtering logic. An account will have the specific permissions if it passes all filters’ validation. A filter can be managed by a member of the consortium and the permissions can be added independently. Each filter has a switch, the filter is effective only when it is switched on. By default, filter is switched off during the initialization. There are different groups within the filter, when the filter is executed, corresponding group (with it’s permissions) is found based on the sender’s account. The Group contains the permissions of deploying contract or calling contract. For deploying a contract only one input sender’s address is needed, whereas for calling a contract four inputs sender’s address, contract address, function and the parameters are required. By default, the group does not have the permission for deploying the contract during initialization. It is possible to configure black list validation which can be effective while calling a contract. If the black list mode is on, no permission will be returned, if the user was added into the black list, even though an account has the permission for an interface. By default, the black list mode is off. An interface is comprised of a function along name with its parameters. The address changes once a contract gets redeployed, so the permissions of the contract need to be re-granted. Chain Super Admin (God account)A chain super administrator is selected by the consortium committee or public, who has all the permissions to the system. This role has following permissions: assign roles to users, add permissions to roles, which includes the permissions to perform any operations. The God account is required to execute the system contracts. Chain/Filter adminA chain/filter administrator can manage filters and audit, modify and delete information of nodes, accounts and contracts on the chain. This role has following permissions: execute the system contracts – CAAction, NodeAction, ContractABIAction and SystemProxy. TraderA Trader is a person who uses the system to conduct business transactions and query the results, the role here can be subdivided based on different business requirements. This role has following permissions: execute and query business contracts. ARPI_Model.js located under folder systemcontract, provides one step execution to start the ARPI mode which includes enabling access control and setting up the roles and permissions according to the previous section ARPI practice on consortium chain. Note: The access control will be enabled after executing ARPI_Model.js, you can be disabled by using the GOD account, to avoid impacting other accounts to deploy or call contracts accidently. AuthorityManager.js located under the same folder systemcontract, used to manage TransactionFilterChain and provides the query interfaces to FilterChain, Filter, and Group. Note: AuthorityManager.js and ARPI_Model.js execution requires God account. The following error is raised if no permission to deploy a contract:Transaction failed to send! Error: NoDeployPermission . The following error is raised if no permission to call a contract:Transaction failed to send! Error: NoTxPermission .OrError: NoCallPermission . //Add a filter to FilterChain with 3 parameters – filter name, version and description. babel-node AuthorityManager.js Group addPermission 1 0x4015bd4dd8767d568fc54cf6d0817ecc95d166d9 ContractA.address "set1(string)"
babel-node AuthorityManager.js Group delPermission 1 0x4015bd4dd8767d568fc54cf6d0817ecc95d166d9 ContractA.address "set1(string)"
babel-node AuthorityManager.js Group checkPermission 1 0x4015bd4dd8767d568fc54cf6d0817ecc95d166d9 ContractA.address "set1(string)"